Tuesday in Barcelona is when things really get going. First up on everyone’s schedule is the VMworld keynote. This is one of times when attendees get to hear from Pat Gelsinger (VMware’s CEO) and a number of other presenters and get an overview of the direction in which VMware are going. It’s also when the major product announcements are officially made. Historically, VMworld Europe is usually the time when management product updates are announced (with some of the more infrastructure based updates happening at the US conference). It’s been slightly different this year I suppose since there was no major update to the core vSphere platform, but there was EVO:RAIL. Another difference that I’ve picked up on this year is that the general sessions at VMworld are now more widely available. Having watched the US conference keynotes, there was a degree of repetition. That’s not to say that I didn’t enjoy it, but it didn’t feel quite as fresh as it did in previous years to me. After the keynote finished, and the hoards poured out of the main hall, I had a meeting with a company called ByteLife and Joerg Lew (one of VMware’s vCO gurus) about a new community initiative called FlowGrab. FlowGrab is a new and developing community for vCO workflows and packages. There are some good things coming with regards to this project and if you’re using vCO, I’d recommend that you check it out. I spent a while after that in the Solutions Exchange talking with representatives of a few companies whose products and services that I’m interested in. Key among those were PernixData, Colt, Atlassian and PuppetLabs. I had two breakout sessions that I was very keen to attend and I was pleased that neither had been moved around (as has happened a few times over the years). The first of these was SEC1746 NSX Distributed Firewall DeepDive. I haven’t done a lot with NSX outside of my lab but it’s an area of great interest to me given its links to vRA (vCAC) and it position as a key component in the SDDC vision. For me it was a good session as it wasn’t all alien (or new) to me but there was plenty in there to make me think and takeaway. 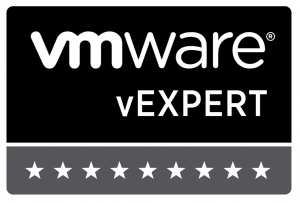 Immediately afterwards I had my second session of the day, TEX1991 vCenter Orchestrator – What’s Next. I’ve worked a lot with vCO in the last year (at times, almost exclusively), so I was very keen to understand the product’s future. Once again, there were things that I knew about and some that I didn’t. I even learned a few things about version 5.5.2 that I wasn’t previously aware of. To round out the day at the conference centre, I had a really great chat with Frank Denneman (PernixData) that has kept me thinking ever since. And I had a couple of brief chats about Xtravirt’s forthcoming beta for a new service called Sonar. As for evening activities, they started with drinks and conversation with some of Xtravirt’s partners in the Solutions Exchange and moved on to Ocana for the vExpert / VCDX reception. As that started to wind down, I moved on to the excellent vJamon party, organised by Cisco’s @CommsNinja.